WASHINGTON (CN) – The Congressional Budget Office said Wednesday that a Republican-backed bill to repeal and replace the federal health care law would raise the projected number of people without health insurance by 14 million next year and by 23 million in 2026. According to the CBO report, the number of uninsured projected in the new version of the bill is only 1 million less than the previous version of the effort to repeal the Patient Protection and Affordable Care Act. The CBO score for the previous bill helped kill the legislation before two key amendments suddenly revived it earlier this month. The new version would cause a 20 percent spike in health insurance premiums in 2018 and a 5 percent increase the next year. After that, however, premiums would largely decrease but would vary depending on if states take advantage of an amendment to the law that allows them to request waivers so insurers can charge less healthy people more if they do not maintain continuous coverage, or offer plans that do not conform to the Affordable Care Act’s coverage requirements, according to the report. The CBO estimates that half of the country lives in states that would not opt out of the Obamacare regulations and that their average premiums would be 4 percent lower than under current law. That number would vary by age, however, because the Republican plan allows insurers to up the ratio between what they charge younger and older people. In states that make “moderate changes” to the requirements for insurers -one-third of the country – premiums in the individual market would be 20 percent lower, in large part because policies would cover less than under the current law, according to the report. The CBO did not estimate how much lower premiums would be for the one-sixth of the country that lives in states that would allow insurers to both cut benefits and charge less healthy people more, saying the variance in premiums among the population would be too great. It did, however, note that at a certain point people with pre-existing conditions would have a hard time finding affordable insurance. The CBO report also notes that elderly people, especially poor elderly people, would end up paying more for insurance when factoring in the decrease in premiums. A 64 year-old with an annual income of $26,000 in a state that does not seek a waiver would see net premiums rise by more than 800 percent as compared to current law, according to the report. In addition, people living in states that change the requirements for what basic benefits insurers must provide could experience higher out-of-pocket costs. The report estimated insurers might not provide maternity care, mental health and substance abuse benefits, among others. “In particular, out-of-pocket spending on maternity care and mental health and substance abuse services could increase by thousands of dollars in a given year for the nongroup enrollees who would use those services,” the report states. While the report found that both the proposed new law and Obamacare will keep health insurance markets largely stable, states that receive both types of waviers offered in the Republican law could see unstable health insurance markets. If passed by the Senate, the new law would reduce the deficit by $119 billion by 2026, mostly because of its cuts to Medicaid and repeals of Obamacare subsidies. The reduction would be larger but for the elimination of taxes contained in the Affordable Care Act and the elimination of penalties for people who do not maintain insurance coverage, according to the report. Though the House passed the health care bill in early May, Republicans in the Senate have been working on their own version of the legislation that they hope will be able to pass the more moderate chamber. The House version passed by just one vote, meaning if Republicans are to finally achieve their goal of repealing Obamacare, they will need to keep members at a better rate in the Senate than they did in the House. 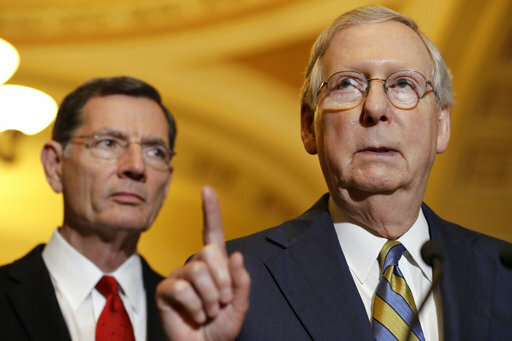 On Wednesday, Senate Majority Leader Mitch McConnell said he isn’t sure he can even muster the votes to pass a dramatically reworked bill. “I don’t know how we get to 50 at the moment,” McConnell said during an interview with Reuters. Even before the report came out, Republicans were acknowledging that it will be difficult for any health care proposal to get the number of votes necessary to pass the Senate. But the fact that Republicans could come up with a bill different than the one that the CBO scored on Wednesday did not stop Democrats from again slamming the House-passed bill.